Currently we have a full size GAA pitch with access to dressing rooms. We are in the process of completing an astro turf pitch in association with the hockey club in Clonmel. This will be based up beside the GAA pitch in our Raheen Road campus. As regards indoor facilities we have access to a sports hall on our Mall campus as well as access to the sports hall in the old army barracks. We also have access to facilities in Clonmel Town and Hillview Sports club. 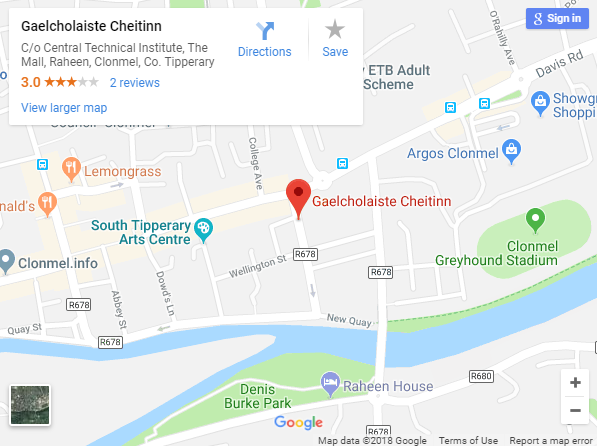 Gaelcholáiste Chéitinn is equipped with up-to-date specialist rooms for the teaching of Materials Technology Wood, Materials Technology Metal, Art, Music, Home Economics, Technical Graphics, Design and Communications Graphics and Computer Studies. 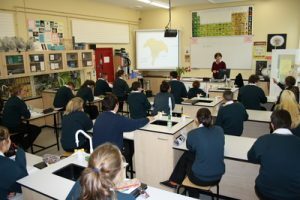 Our science room is one of the most up to date rooms in the building. Fully equipped with access to electrical, gas and water services from every work bench. At Gaelcholáiste Chéitinn we aim to provide high standard information and technology services and support to students. Students have state of the art computing facilities, which enable the provision of a specific IT syllabus to Junior Cycle students. All classrooms are equipped with data projectors and PCs to facilitate the use of ICT in teaching and learning. The iPad initiative which was brought in during 2015 means that all students entering the school work with iPads which enables them to learn through new mediums in the classroom.